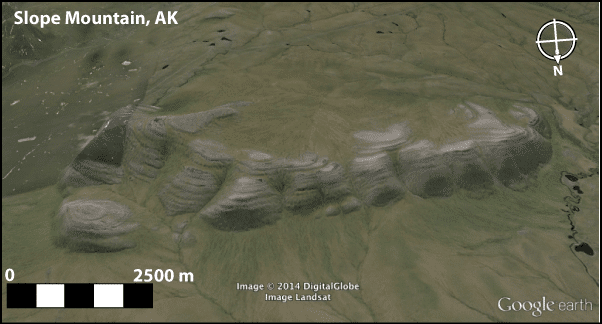 What: Arctic Alaska experienced great tectonic and climatic change during the mid to Late Cretaceous. We will document the sedimentary, pedogenic, and biologic responses to these changes by measuring stratigraphic sections of thick marine, deltaic, and alluvial sediment of the Nanushuk Formation exposed in synclines found in the northern foothills of the Brooks Range. Analysis of sedimentary facies, paleosol morphology, stratigraphic architecture, and fossil assemblages will be used to track changes in sediment provenance, depositional system morphology, relative sea level, and paleoclimate proxies for precipitation and temperature. Figure 1. Oblique view of Slope Mountain showing the visible Nanushuk Formation stratigraphy on the north side of the syncline. Modified Google Earth screenshot, with vertical exaggeration of 2x. Where: Program participants will travel to Fairbanks, Alaska, where we will convene to purchase food, organize and pack supplies, and take a mandatory bear safety course taught by staff from the University of Alaska Fairbanks. We will then travel up the Dalton Highway to Slope Mountain, Alaska (N68.75º W149.03º), where we will work and camp for 2-2.5 weeks. The final week of the project will take place on the University of Alaska Fairbanks campus, where we will consolidate field notes and maps, begin to digitize stratigraphic sections, and prepare samples for analyses. Figure 2. 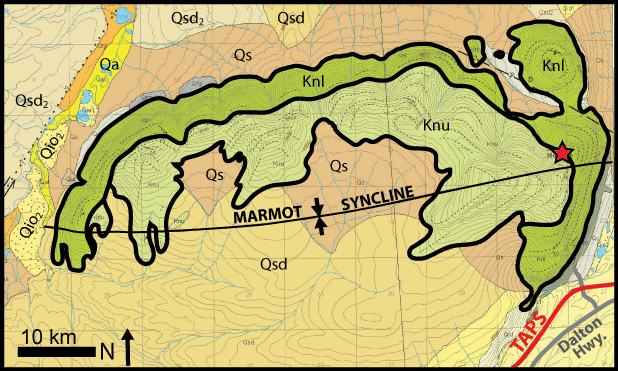 Geologic map of Slope Mountain, also known as Marmot Syncline. The Nanushuk Formation (Knl and Knu) consists of alluvial, deltaic, and shallow marine facies deposited during the Albian-Cenomanian ages of the Cretaceous. The Dalton Highway and Trans Alaska Pipeline System (TAPS) run just to the east of Slope Mountain. Project Overview and Goals: The broad goal of this project is to introduce students to field and lab techniques in sedimentology, paleopedology, stratigraphy, and paleontology, and to encourage students to think of Earth as a dynamic planet that experiences change driven by the interaction of tectonic, climatic, and biologic forces. Each student will develop a unique project from the larger set of data we will collect as a team. · Interpretation of sedimentary facies and depositional environments from sedimentary structures, stratigraphic architecture, and fossil assemblages. · Analysis and characterization of paleosol features in outcrop and thin section, with possible isotopic analyis of paleosol siderites. · Digital mapping of Marmot Syncline, including detailed stratigraphy and structural geology. · Identification of plant fossils, invertebrate animal fossils, or trace fossils in outcrop, with an emphasis on photography and measurements for documentation and environmental interpretation. · Thin-section petrography, to determine sandstone petrology and provenance. Working Conditions: The field site for this project is REMOTE. We will live on the tundra at nearly N69º latitude, cooking our own food and sleeping in personal tents. There will be no “bathrooms” or shower facilities, and no internet or cell phone coverage. There will also be mosquitoes beyond belief. And it will be great! Daytime research will involve hiking up to 15-20 km (~10-12 miles) in rugged terrain, so please consider your interest in physical working conditions. Though we will be at a relatively low altitude, some of the terrain will be moderately steep. Daylight is essentially endless during July, with approximately 1 hour of “darkness” between sunset and sunrise. Anyone with light-related sleeping issues should consider a sleeping mask. Though the constant light can make people very productive, we will only work 10-12 hours in the field, as we will be responsible for our own cooking and camp maintenance. Figure 3. 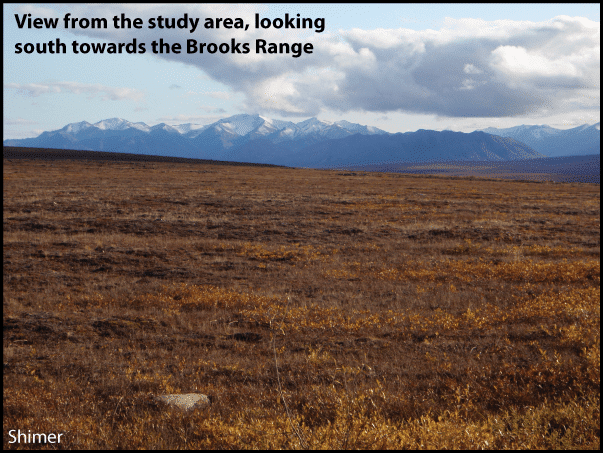 This view shows the tundra ecoystem of the Brooks Range foothills, as well as the Brooks Range to the south. The photo is from late August. In July the tundra is green, with abundant wildflowers. Daytime temperatures in the Brooks Range foothills during July and August range generally range from 40º-80º F (4.5-27º C). Light rain and light snow are possible, and quality raingear is a requirement for this program. Wildlife includes ubiquitous mosquitoes, as well as caribou, musk oxen, wolves, foxes, birds, fish, and grizzly bears. You will undergo bear safety training prior to going into the field, and electrified fences will protect camp. Students will carry capsaicin bear spray outside of camp, and will always travel in numbers for safety. Students will not be allowed to bring personal firearms, as capsaicin “pepper” spray has a higher success rate of bear attack prevention and a zero rate of accidental fatalities. At least 1.5 weeks will be spent in Fairbanks, Alaska, on the University of Alaska Fairbanks campus. Here we will process samples and data from the field, and potentially gain experience with instrumental facilities. During our time in Fairbanks students will stay in campus dorms or in local housing. The cost of campus housing is included in the program budget, which also includes a daily stipend for food costs. Several restaurants are within easy walking distance of campus, and laundry facilities are available at the student center. Recommended Additional Courses: Earth History; Structural Geology, Mineralogy, Petrology, Paleobiology or Paleontology.